Look up subpoena or subpœna in Wiktionary, the free dictionary. The term subpoena is from the Middle English suppena and the Latin phrase sub poena meaning "under penalty". It is also spelled "subpena". The subpoena has its source in English common law and it is now used almost with universal application throughout the English common law world. John Waltham, Bishop of Salisbury, is said to have created the writ of subpoena in the reign of Richard II. However, for civil proceedings in England and Wales, it is now described as a witness summons, as part of reforms to replace Latin terms with Plain English understandable to the layman. Subpoenas are usually issued by the clerk of the court in the name of the judge presiding over the case. Additionally, court rules may permit lawyers to issue subpoenas themselves in their capacity as officers of the court. Typically subpoenas are issued "in blank" and it is the responsibility of the lawyer representing the plaintiff or defendant on whose behalf the testimony is to be given to serve the subpoena on the witness. If a witness is reluctant to testify, then the personal service of subpoena is usually required with proof of service by non-party server. The subpoena will usually be on the letterhead of the court where the case is filed, name the parties to the case, and be addressed by name to the person whose testimony is being sought. It will contain the language "You are hereby commanded to report in person to the clerk of this court" or similar, describing the specific location, scheduled date and time of the appearance. Some issuing jurisdictions include an admonishment advising the subject of the criminal penalty for failure to comply with a subpoena, and reminding him or her not to leave the court facilities until excused by a competent authority. In some situations the person having to testify or produce documents is paid. Also, the party being subpoenaed has the right to object to the issuance of the subpoena, if it is for an improper purpose, such as subpoenaing records that have no relevance to the proceedings, or subpoenaing persons who would have no evidence to present, or subpoenaing records or testimony that is confidential or privileged. Standing committees in both houses of the United States Congress have the authority to send out subpoenas for legitimate lawmaking and investigation purposes. This compels the production of testimony or records, and failure to respond constitutes contempt of Congress. In New Zealand, subpoenas are governed under the rules of the court in which the subpoena is issued. 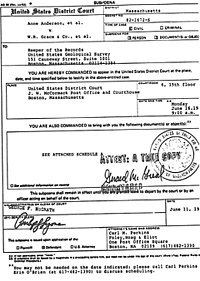 ^ "Example Copy of Subpoena in Anderson v. Cryovac landmark case". ^ Webster's New Collegiate Dictionary, p. 1160 (8th ed. 1976). ^ See, e.g., 18 U.S.C. § 1429; 18 U.S.C. § 3333(c)(1); 18 U.S.C. § 1968(c); and 28 U.S.C. § 1365. ^ Curtis, John (1860). A School and College History of England. Simpkin, Marshall and Co. p. 139. Retrieved 1 May 2017. ^ "Pro Se Litigants / Representing Yourself". ^ "Los Angeles Criminal Court Subpoenas / Rules and Regulations". ^ "Wilkinson v. United States 365 U.S. 399 (1961)". justia.com. Retrieved May 18, 2017.